Still recovering from the long weekend, I was not too excited about cooking a big meal yesterday for supper…..ssoooo I didnt & instead I made a mouth watering pasta dish that left us wanting more & more! (damn I maybe should have wrote this later in the afternoon seeing I am getting hungry just thinking about it!) It was a fairly quick dish to make.. but even better it was easy. First get the pot for your tortellini full of water & on high heat. While you are waiting for it to boil make your Alfredo sauce. Alfredo Sauce – In a small sauce pan over medium heat add butter & garlic. Let it melt. Then add your heavy cream. Whisk together & let it heat through. Once the mixture is warm add the Parmesan cheese, whisk it in so there is no lumps. Then add salt & pepper to taste & a couple dashes of basil. Put lid on & turn heat to low. Let it sit for 20 minutes on heat for flavors to all infuse. (This sauce is to die for!) Also make sure to stir it a little during the 20 minutes. Next add your tortellini to the boiling water. Follow directions on package. Mine said to boil for 8 minutes. While the tortellini is boiling, take out a frying pan, add a tbsp of butter or olive oil.. whichever your prefer (I LOVE BUTTER.. I don’t care what you say.. Butter is Better.. Especially for the hips!). Throw in your mushrooms & chopped zucchini. Let them cook over medium heat. Be sure to mix them around every once in awhile. 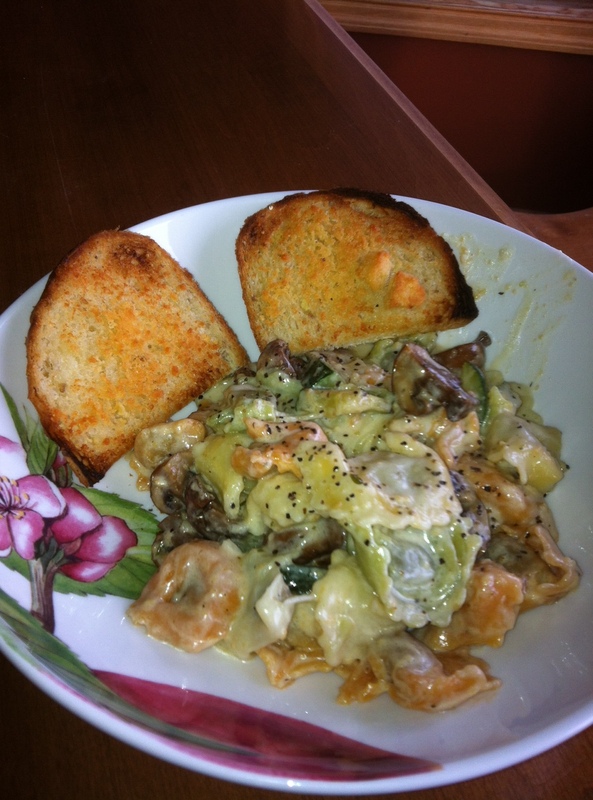 Once your tortellini is cooked, the veggies & sauce should also be ready to go. Mix them all together & WhaaaaLaaaa! Its done.. it smells spectacular… & you will not be able to wait to dive on in! I also broiled some garlic cheese toast. I just spread some butter, tossed a tad of garlic powder & parmesan cheese & placed it under the broiler (500 F). SET YOUR TIMER (if your like me & walk away from the oven only to return to blackened ash!) for 40 sec or 1 min pending on your broiler. T absolutely LOVED this dish as well. The homemade Alfredo Sauce is definitely the added touch that puts it over the top, its so much better then most that you can buy at the store…plus you can put any spice that you like in it to make it your own. The best part for me was that for once I had all 3 pots right on time with each other. I find that the more you cook the better your timing gets… & this just makes things that much tastier.. nothing gets over cooked from sitting…or cold. Num Num Num! Lucky for me I made a big batch so T & I get to enjoy this dish & make everyone at work jealous during lunch today! Hope you Enjoy.. Let me know if you add anything different when you make your dish! ← Sewww Thats How Its Done!